Crag Hill (or Eel Crag) is almost at the centre of the mass of fells between Crummock Water and the Newlands Valley, and has impressive crags on all but its western flank. Crag Hill is also known as Eel Crag, but this is really only the name of the northern-most crags of the fell which overlook the top of Coledale and the mines around Force Crag. Crag Hill plays a prominent part in the view of the fells north of the Newlands valley from Keswick and the east, forming a partner to Hopegill Head as the highest ground seen. From this angle the fell is seen as the end of the long ridge that runs over Causey Pike and Sail, culminating in the crags of Crag Hill. In form Crag Hill is a three-sided pyramid, with steep craggy north-eastern and south-eastern faces and a smooth, grassy western face. 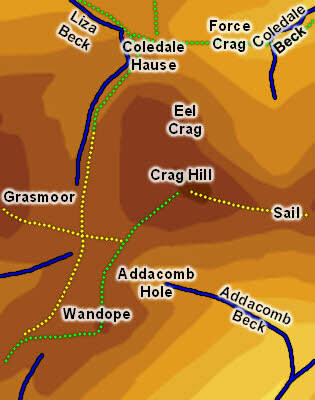 There are two main paths that lead to the top of Crag Hill. The most dramatic comes up the eastern ridge from Sail, with crags on both sides. The safer path comes up from a crossroads of paths that link Whiteless Pike, Crag Hill, Grasmoor and Coledale Hause. This path climbs east until it reaches the top of Addacomb Hole, then follows the line of the crags north-east to the summit. One could cut a corner if coming from Coledale Hause and turn east before reaching this path, but much of the north-western slope is awkwardly steep, so little time would be saved. Wainwright offers a number of other more dramatic routes of ascent that explore the crags - for more details see the North Western Fells. Our ascent of Grasmoor also visits Crag Hill before continuing to Coledale Hause and Gasgale Gill. Crag Hill might be an impressive fell, but it covers a surprisingly small area on the ground. Its western boundary is formed by the upper reaches of Liza Beck, which flows north to Coledale Hause before turning west to enter the dramatic valley of Gasgale Gill. The southern boundary is formed by Addacomb Beck, which rises in Addacomb Hole, a fine example of a hanging valley. To the north-east the upper reaches of Coledale Beck flow below the crags before flowing past (but not over) Force Crag. No beck flows east from Coledale Hause.